Duty without empathy and imagination is handsome. As you can see; I’m not high on the Call of Duty. I see the character value of ‘duty’ through too many irritating-to-unjust life experiences. When someone sounds the clarion call to duty – young people are at risk, women are shut up, and the liberty that is dangled in front of people of color will likely later be mangled or withdrawn. 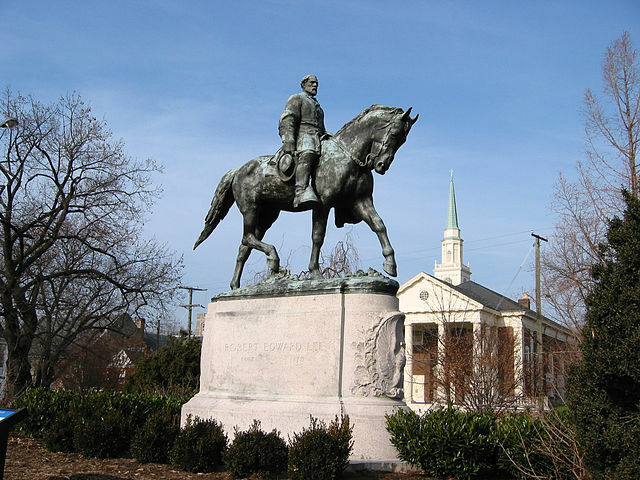 So now that I have offended many; let’s talk about that Paragon of Duty - Robert E. Lee. You already know he was the savvy military strategist general of the Confederate Army. He commanded a smaller and less resourced army than the Union Army, yet he held them off for four years. Lee was born to a Revolutionary War hero father, Henry “Light Horse” Lee and a Virginia debutant. Henry had been a spectacular cavalry rider who quickly advanced through the ranks of the Continental Army. After the war Henry Lee joined politics where he eventually became Virginia’s Governor. He married his famously beautiful cousin; she would die eight years later leaving him with three small children. At age 37 he remarried another beautiful Virginia debutante named Anne Carter who would bear several children, one of them Robert. Henry eventually left politics, farmed badly, and invested poorly. Land speculation was rife; many from the Founding Fathers generation were losing their property. Henry Lee lost his first wife’s plantation and went to debtors’ prison for a year. Little Robert E. Lee was two when his daddy went to prison. He and his blended family moved to a rented house in Richmond where relatives supported them. His father came home from prison; later he was beaten, tortured, and almost killed in a Baltimore riot. (Emotions ran high regarding whether the US should go to war against England/War of 1812. Henry Lee opposed it, the mob supported it.) Henry Lee sailed for the Caribbean to try to heal from the physical wounds and PTSD of that assault but instead of healing he died, leaving 11-year old Robert and his siblings under the care of their frail and impoverished mother. A relative arranged for Robert to attend West Point Military Academy. He was a perfect student, earning all A’s and NO conduct demerits, a record not matched again until a century later, by Douglas MacArthur. Duty was a life preserver for this boy raised on tales of valor and grandeur. Robert was the son of a privileged family that went broke. His beautiful mother was not strong. Little Robert played with slave children, yet he would grow to accept a worldview where he deserved opportunity when his childhood friends didn’t. Where a lot is going on; obeying duty might be easier than figuring out a complicated family and life. At 22 he set his sights on his own Virginian debutante. Mary Anna Randolph Custis, the great-granddaughter of Martha Washington, was lovely, lively, educated and a true ‘blue-blooded’ catch. It took a year for Robert to win her heart and her father’s approval. Yet soon after they were married Robert began what would be his life pattern. His job was similar to that of being a civil engineer in the Army Corps of Engineers now. He managed infrastructure construction projects for the US government. Some projects were fairly close to Arlington, his wife’s family’s plantation home. He would live short periods of time at Arlington, but often he would be gone for months and sometime even a year or two. He and Mary had seven children; she had to raise them without his help. At Arlington her extended family and enslaved servants did much of the work. Occasionally she would try to move to whatever town Robert was working in, but that didn’t work well for them. He complained to a friend in a letter that she was not an organized homemaker. She was artistic, a reader, thinker, and charming conversationalist. She dressed imaginatively and encouraged her children to be creative. She was not interested in or very competent at housecleaning, laundry, and endless cooking. He did not respect that she could not or would not “do her duty” first. Also, she was often ill with chronic fatigue, crippling arthritis, lack of appetite, and debilitating weakness. Several times she nearly died. During a difficult pregnancy she asked Robert if he would take leave to come home and help her. He wrote back that she not ask him to be derelict to his duty. It was clear in his mind that duty was what a man owed was to God, to country and army, and then to family. His father-in-law passed away in 1857 leaving the massively-in-debt estate of Arlington. Robert unhappily took a 2-year absence from the Army to untangle the mess. His father-in-law had promised his slaves that they would be freed upon his death. The legal will document he left, though, stated that the slaves should be freed within five years of his death. Robert looked at the debt and pronounced the slaves needed to work the next five years to help the family become more financially secure. Upon hearing that their promised freedom had been yanked from them, three slaves escaped. They were eventually captured and brought back to Arlington where Lee had them severely and publically whipped and beaten; both the two men and the woman. Lee knew what his duty was; to protect and preserve the family fortune. He believed it was the duty of enslaved people to do all that their master asked of them. His concept of duty had no imagination in it for the powerful rights or feelings of those who were enslaved. Robert E. Lee was a brilliant military general. He was not intimidated by sending soldiers into harms’ way. Two years after it started, the Civil War was finally led by two excellent generals – Lee and Ulysses Grant – and one of the reasons they were both so “good” was that both unflinchingly sent their men into battle. Part of Lee’s strength came from his sense of duty. He was willing to do himself what he was sending his men into, so he sent them. This is a complicated strength to possess; the ability to not empathize, or at least to not change one’s plans, on the basis of the fear or reluctance of others. Robert E. Lee lived 170 years ago. It is not fair to judge his character then on the basis of who we are now. I understand this. But his life and choices do shine a light. We are still infatuated by heroes. We lift up values of loyalty, valor, bravery, duty. Do we know what we mean? If our country says to step up and serve – is it always our duty to obey? Did we not learn in Vietnam that sometimes (often) wars are about propping the electability of politicians and the profits of mega-businesses? Sometimes our duty is to say no and face the consequences of preserving our lives and those of citizens in other places. If our particular family needs more than is convenient to give, to what can we say no to in order to say yes to our kids and partners? Can we say no to the ordinary and generally unquestioned obligations of American family life? Kids sports, church obligations, too much electronic entertainment? Can we step back from the time and energy an interesting and worthy career can require in order to have more time and energy for our families? If we are caught among the needs of several generations – is it our duty to do all and be all to everyone? Can WE decide what duty needs to mean to others who have less (or no) freedom, resources, and options than we do? Can we decide what hoops an undocumented immigrant must hop through – when we KNOW most of our ancestors came here under the single requirement to not have tuberculosis? Do we have a duty to people we don’t know, who are trapped in terrible situations around the globe? Maybe it’s our option to completely throw out the value called duty. If we have compassion, love, energy, and empathy – we will go hard places and do hard things. We do not need someone telling us what we have to do; if we have enough education and mercy in our own lives we will see what needs to be done and then find the courage and grit to do it. Well - there were sure a few sentences in there that hit close to home. (Eyebrows raised). Good read! Perfect timing...in the midst of decision-making re:taking care of me or taking care of my mother (who is in a safe place). Best of luck deciding how to do that. You are a very kind and generous person; you have every right to trust your own heart on this.